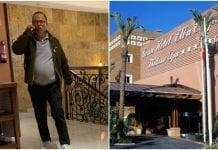 TOTALLY unperturbed by the drama unfolding around them, a group of golfers played through a fire that caused 200 families to be evacuated from their homes. 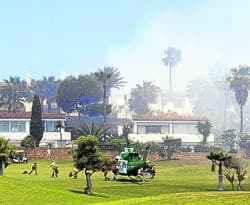 The four-ball stuck defiantly to the job in hand as dark black smoke engulfed the sixth fairway of Duquesa Golf. 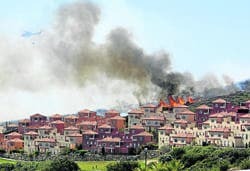 Carried by strong winds, in a short time flames were leaping high into the air just metres behind homes in the Monte Duquesa urbanisation near Manilva. Oddly though, the nearby golfers hardly took a glance in the fire’s direction. 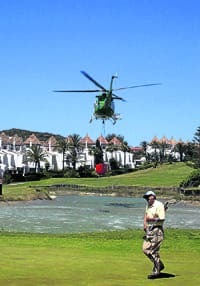 That was until a large helicopter picked its landing spot on the fairway and 11 firemen decamped with equipment to fight the blaze running right across their line. In total, eight fire crews were needed to bring the blaze under control. No one was hurt and no property damaged, but the huge, once white sign of Golf Duquesa, now dangles blackened and reduced to a few sorry-looking letters. Next articleDo you know the way through San Pedro? Looks like a classic British reaction. Finish the game of bowls, and then defeat the Armada.